As you know we love freebies and giveaways, but today, we are here for a bit of a different reason, sort of a reverse giveaway – A Give Back. What do we mean by a give back? Let me explain. Each year around the holidays we all look a little deeper in our hearts to see what we can do give back to our local communities, or at least I do. This year, thanks to the partnership between Goodwill and Give Back Box, they have made it easier than ever. You may not know this, but Goodwill sells donated goods through more than 3,200 stores across the United States and Canada, and channels more than 85 percent of sales revenue to provide those services to people who are unemployed or underemployed. If you have some old, gently used items around the house, or some clothes hiding in your closet that no longer fit, or maybe you need to make some room for the new year. Let me show you how you can give back to your community and declutter your house. First, I want to tell you about the reverse giveaway or rather the “Reverse Haul”. We’ve all seen those posts and videos of our great thrift store finds, right? We love seeing all of those great deals and finds. This year, lets share the items you plan to giveaway send us your pics or videos of the stuff you plan to donate using the hasthtag #DonateStuffCreateJobs. You can even use Goodwill’s impact calculator to let the world know how many hours of on-the-job training you are creating with your used stuff — stuff that doesn’t help anyone when it’s in the back of your closet or under your bed. This year, many of us have done some online shopping. Did you know that through the partnership between Goodwill and Give Back Box, you can give that box a second life? When you shop online this holiday season, many major retailers will send your purchase in a Give Back Box, which will enable you to donate items to your local Goodwill at no cost to you. This program gives every cardboard box a second life to help people in need. Visit GiveBackBox.com for more information. Giving back this year is so simple. And the best part is, by giving our gently used items to Goodwill we are helping so many people. Today, 8.9 million Americans are out of work, and nearly 15 percent of the workforce is underemployed, which includes part-time workers who would prefer full-time employment. The 164 local and independent Goodwill nonprofit organizations provided job placement services, career counseling, onsite and virtual skills training, and other community-based services (such as financial education, youth mentoring and access to transportation and child care) to millions of people last year. Nearly 2 million people engaged in face-to-face Goodwill services to advance in their careers, and more than 35 million people accessed Goodwill’s virtual education, training, mentoring and online learning services to strengthen their skills and gain industry-recognized credentials. 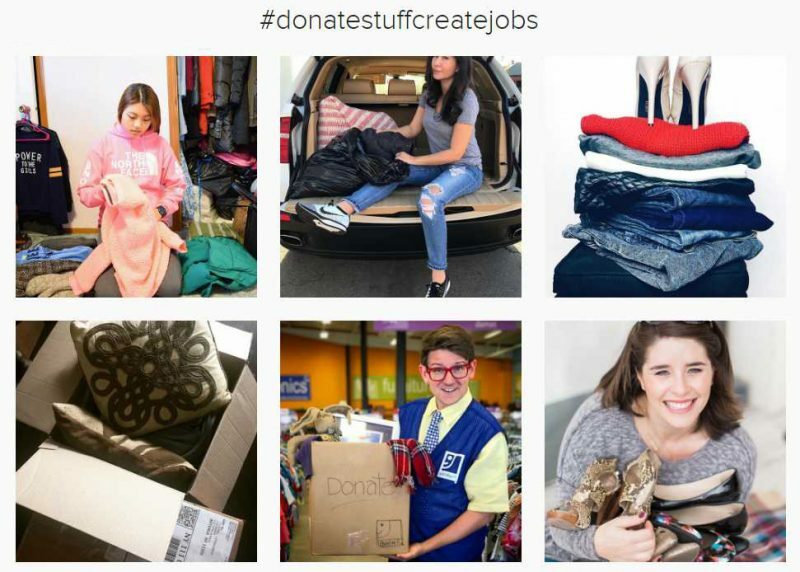 So you’re literally donating your stuff AND helping to create jobs. The icing on the cake with this partnership is that it can continue year round. We can all do our part to help get our communities back to work simply by donating our stuff. Check out Goodwill’s donation impact calculator, a feature available within the Goodwill Locator App and at Goodwill.org (click “Explore Our Map” on the homepage to access the calculator). Simply input the items you’re donating to calculate the number of hours of career counseling, on-the-job training, résumé preparation, financial planning classes, and other services you’ve helped provide to people facing challenges finding employment. Together we can make a difference! I love this! We always donate to Goodwill. Never had a Give Back Box before though. Thanks for sharing. !